You saw the photo. A dedicated teacher in Ghana, trying to show his students how to use Microsoft Word… On a blackboard. The hand-drawn pictures of that all-too-familiar (for those of us in wealthy nations) user interface were amazing. But still. It’s sad that a country that cares about public education as much as Ghana can’t afford computers for all their schools. Well, there’s some good news. 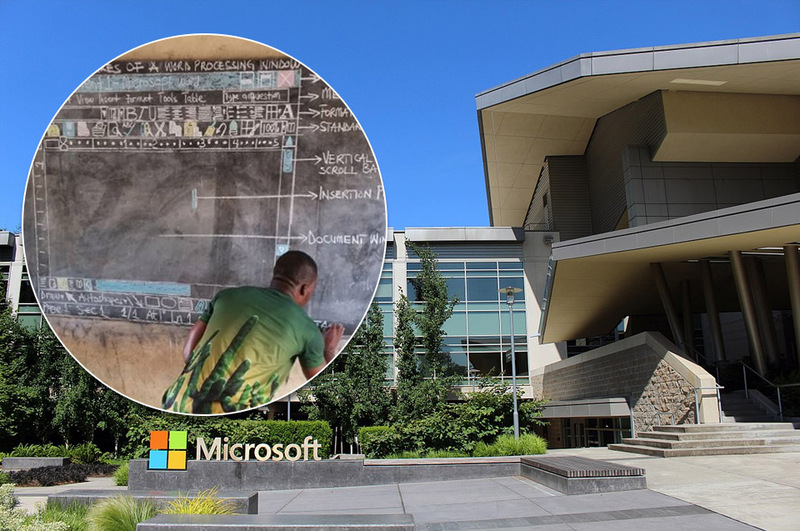 The photo of the Ghana teacher drawing a diagram of Microsoft Word on the chalkboard went viral, as we posted last week. And it finally landed on the desk of a person who could do something about it. What he was teaching was word processing. And how he was teaching it was by carefully copying the user interface from a printout, then explaining what each of the buttons did. The drawings were exquisite — precise and in many colors. But the fact was, it’s hard to teach kids how to use computer software without computers. And in rural Ghana, that’s the norm, rather than an exception. ‘This is not my first time [of drawing] it. I have been doing it anytime I am in the classroom,’ Akoto told Quartz Africa. Akoto, age 33, is the information and communication technology (ICT) teacher at Betenase M/A Junior High School in the town of Sekyedomase. In addition to all of their other subjects, if Akoto’s students want to go on to high school, they’ll have to pass a national exam. A national exam that includes using computers — even though they may never have laid hands on one in their lives. The story, understandably, went viral. One of the people who saw Akoto’s photos was a popular Ghanaian comedian, Teacher Kwadwo. (who is also a teacher). Kwadwo shared the photo with his 140,000 Facebook fans. The story quickly spread throughout Africa. Rebecca Enonchong, a tech entrepreneur in Cameroon, got wind of it and asked her followers to find out who the teacher is. Apparently, The teacher's name is Owura Kwadwo. He teaches in Gbolo Alzariya English and Arabic Primary school in the Sagnarigu district of the Northern Region, rural Ghana. Enonchong then sent a tweet to Microsoft Africa asking for help. Others turned up the pressure. As a result, Microsoft has promised to equip Akoto with a device from one of their corporate partners, and give him access to their MCE program. In addition, Akoto will have access to Microsoft’s free professional development resources. Akoto says that for his school’s computer lab to really get off the ground, he will need at least fifty computers. But it’s a good start! Schools in Ghana are facing many of the same challenges that United States public schools are facing. Schools are underfunded and lack resources. Teachers are overworked and have to make do with far fewer supplies than they need. Public school is free, but often inadequate. As a result, low-income parents often feel pressure to choose between private schools or other needed resources. And often times, the private schools that market themselves to low income families all across Africa are inadequate as well. The Bill and Melinda Gates Foundation is working to help people lift themselves out of poverty. In addition, the Foundation is spearheading innovative educational initiatives. But their efforts in the developing world focus mainly on health and infrastructure. Their educational initiatives appear to focus mainly on the United States. Perhaps Mr. Akoto’s work will inspire the Foundation to expand its educational work to include Africa? We wish School Master Akoto and his students all the best, and hope Microsoft will step up to the challenge. Featured image | Composite: CC By-SA 4.0 CoolCaesar via Wikipedia (background); Owura Kwadwo Hottish Richard Appiah Akoto) via Facebook (inset).